Material: Heavy Duty SBR & EPDM, Not foamed. Weight:3.0 lbs per piece（1.38kgs/pc),Total 18.0lbs each set(6pcs). The Interlocking rubber mats provide a cushion to hard floor surfaces in playrooms, classrooms, gyms, and more! These mats are perfect for exercise, gymnastics, yoga, Cross fit, Pilates, MMA,daycares, workshops, fitness rooms, camping and poolside areas. These gym tiles can also be used as play mats for play rooms. The exercise mat can easily hold the weight of heavy machinery for ultimate safety and protection. Soft rubber is durable, non-toxic, premium rubber that is lightweight and easy to assemble. Multi-purpose interlocking rubber floor mats, rubber tile, 500 x 500 mm, made of heavy duty rubber, much long last than foam mats, much comfortable than PVC mats.Convenient 20" x 20"heavy-duty rubber flooring made of SBR & EPDM rubber that offers abrasion resistance and unmatched durability. 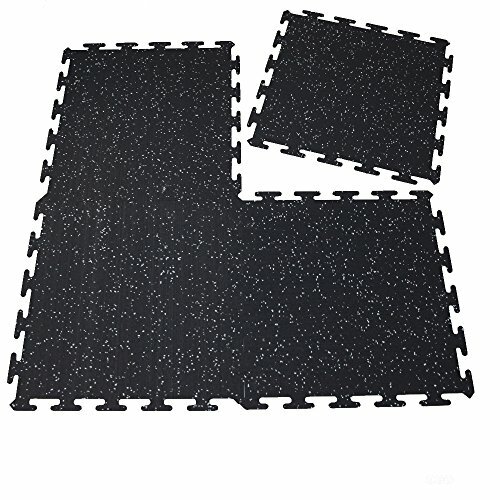 Provides vibration reduction and shock absorbent qualities that make these mats ideal as commercial rubber gym tiles. These rubber tiles allows for a simple DIY installation, You can get a widely gym area in short time.durability. Works perfectly as rubber garage flooring, weight room mats, home gym flooring, flooring in a basement, treadmill mats, kennel mats, exercise mats, or flooring industrial warehouses! Easy to intall a very large fitness floor by yourself, got a whole rubber floor in a short while. We also have other size exercise mat for you to choose, please click or search "revtime"
If you have any questions about this product by RevTime, contact us by completing and submitting the form below. If you are looking for a specif part number, please include it with your message.